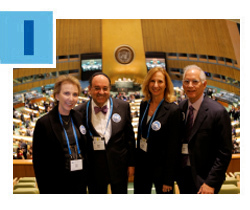 Four Jewish leaders from Miami joined their peers from 50 other communities last week in New York for The Jewish Federations of North America’s first-ever mission to the United Nations, chaired by Saby Behar, a Past President of the Greater Miami Jewish Federation. The one-day trip enabled participants to discuss the Israel and overseas agenda, as well as Israel's concerns, with UN Ambassadors from Israel, Ukraine, France and Canada; the Middle East representative of the UN; and the chief spokesman for UN Secretary-General Ban Ki-Moon. 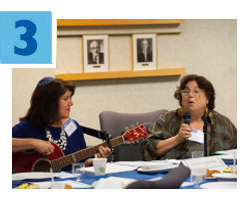 Pictured at left: Rosi and Saby Behar, Federation’s Jewish Community Relations Council Chair Shelley Niceley Groff and Federation Board Chair Robert G. Berrin. The whole is greater than the sum of its parts. Professionals and volunteers from the Michael-Ann Russell JCC on the Sanford L. Ziff Campus, Scheck Hillel Community School and Jacobson Sinai Academy met recently to discuss opportunities to grow and strengthen North Dade’s community of more than 70,000 Jews. 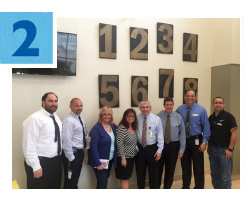 Located within close proximity of one another, the three institutions are anchors on the “North Dade Jewish Campus,” which is populated by multiple Jewish organizations. All three receive annual support from Federation. At the meeting, representatives shared ideas about Israel advocacy and education, security, cooperative purchasing and marketing, among other topics. Click here to read more. As Passover approaches, local teens will join civic and criminal justice activists, and representatives from the Jewish and Christian communities for the Third Annual Advocacy Seder on Wednesday, April 13 at the Greater Miami Jewish Federation. Presented by Federation’s Human Trafficking Task Force – an initiative of our Jewish Community Relations Council and our Women’s Philanthropy – the seder is designed to spread awareness and decry the evils of modern-day slavery. The Task Force is chaired by Nancy Zaretsky. Click here to read more. 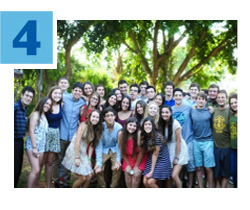 This summer, give your teen the chance to discover Israel through the Alexander Muss High School in Israel (AMHSI). A partner agency of Federation, AMHSI is an accredited international study abroad, college-prep program where the land of Israel becomes a living classroom. Students explore Israel and 4,000 years of Jewish history in chronological order, and are eligible to receive high school credit, and college credit from the University of Miami. The 6-week summer session begins June 22, and space is limited. For details, contact Andrea Schleider at aschleider@amhsi.org or 954.805.5578, or Alicia Press at apress@amhsi.org or 954.817.7108. 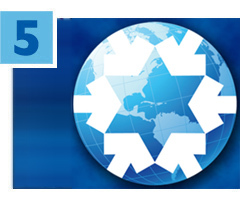 Anywhere in the world Jews are in need, Federation is there to help. Through partner agencies such as the American Jewish Joint Distribution Committee (JDC), The Jewish Agency for Israel and other non-governmental organizations (NGOs), your Federation support provides nutritional, medical, social-service and other critical aid to the most vulnerable individuals and families in Israel and in more than 70 other countries across the globe. To make a donation, click here.